Fairy Gardens are gardens in miniature designed to lure fairies and earth spirits, and the good fortune they bring. Young as well as old gardening aficionados are drawn to create these tiny jewel gardens. 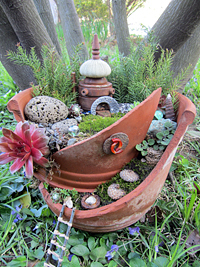 Decorate your fairy garden with tiny furniture, gardening tools, water features, etc. Here is a list of just some of the many hundreds of plants that can work in your fairy garden. Keep in mind sun exposure and hardiness information when choosing your plants. Your imagination is your limit. Enjoy and Good Luck! For more information please contact Mary Vaananen (maryv@jelitto.com).